The Cochrane Alliance Church (CAC) Youth are hosting a concert by the University of Lethbridge Steel Drum Band on April 24th to raise funds for a youth trip to Guatemala. 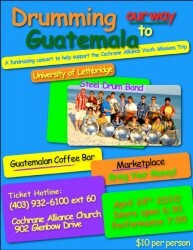 This Steel Drum Band has travelled the world and we anticipate a wonderful evening of great music. Come and enjoy the entertainment, sip a coffee a the Guatemalan coffee bar and shop at the market! The Cochrane Alliance Youth are going to Guatemala in July to build a house in the village of San Raymundo (NW of Guatemala City). CAC is partnering with “Hungry for Life Organization” for 5 years so they will be going to San Raymundo for the next 5 years to assist in their village. The youth will also be working in a local market, visiting an orphanage and mingling with the locals to help out wherever they can.